The story behind Voyager - a tiny spaceship 12 billion miles away from Earth, leaving our solar system and entering the void of deep space - and the people who made her. 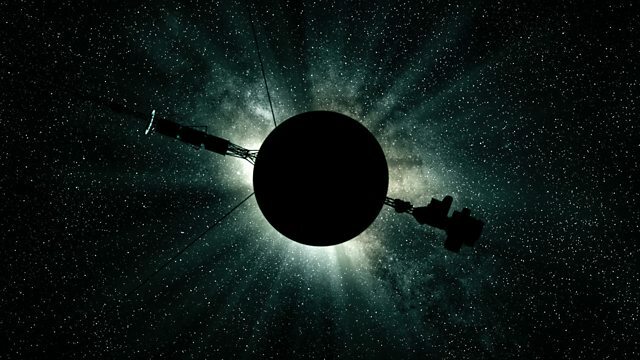 12 billion miles away, a tiny spaceship is leaving our solar system and entering the void of deep space. It is the first human-made object ever to do so. Slowly dying within its heart is a plutonium generator that will beat for perhaps another decade before the lights on Voyager finally go out. But this little craft will travel on for millions of years, carrying a golden record bearing recordings and images of life on Earth. The story of Voyager is an epic of human achievement, personal drama and almost miraculous success. Launched 16 days apart in 1977, the twin Voyager space probes have defied all the odds, survived countless near misses and almost 40 years later continue to beam revolutionary information across unimaginable distances. With less computing power than a modern hearing aid, they have unlocked the stunning secrets of our solar system. The Farthest – Voyager’s Interstellar Journey tells the story of these magnificent machines, the men and women who built them and the vision that propelled them farther than anyone could ever have hoped. I think both are equally vital, but for this film I certainly focused very deliberately on the characters at the heart of the story, to give the audience a real human experience of being part of the team that could dream up such an audacious dream, and pull it off! Science can be quite intimidating so I felt it was very important to really connect the personal story to the audience with warmth, humour, honesty and humanity. I’ve had a massive love of space and science since I was a child - I was astronomy and science fiction obsessed - and for the longest time wanted to be an astronaut. Voyager was arriving at ever more distant planets throughout my childhood, and dazzling me with the reports and pictures and scale of the achievement, and I always found it such a thrilling and poetic story. When we were exploring making a film about it in 2013, NASA suddenly announced that voyager one had officially entered interstellar space - the first human made object to ever do so - and that was the spark and impetus to make the film - to mark and celebrate that momentous moment. We received a very enthusiastic response to the idea from the start, so it was about two-and-a-half years from idea/treatment to the beginning of pre-production. That space is marmite! The subject really divides people. Every time I mention the film, some people, both young and old, light up and get wonderfully enthusiastic, but some just glaze over! I never knew that! Blinded by my own love obviously! Luckily the film also has the golden record element of the story - the time capsules of life on earth that are onboard the spacecraft, containing music and images to communicate with aliens, were we to ever encounter any. This emotional, hopeful and creative side of the story appeals to the non-space lovers! Adam Curtis ‘Hypernormalisation’ but really everything and anything that Adam Curtis makes. I also loved Michael Madsen’s ‘Into Eternity’ for its aesthetic tone and intellectual curiosity, and ‘The Possibilities are Endless’ by James Hall and Michael Lovelace, a film full of hope. Errol Morris’ ‘Fog of War’, was a total eye opener for me in terms of the filmmaker taking a position. I also vividly recall seeing Fred Weisman’s ‘Titicut Follies’ in college and being blown away. Satirical sites like ‘The Onion’ and ‘Waterford Whispers’. In times like these may be the only rational response is grim laughter. Peter Singer, moral philosopher and author of ‘Animal Liberation’, which had a profound effect on me when I first read it. Take your time in the interview. Most of the interviews we conducted for the farthest were over three hours long, and over that time the interviewee has time to unwind, and the intimacy and connection really pay off. When a leading NASA scientist, half way through the interview, kicked off his shoes and sat back, I knew we were really getting somewhere! A long lens, the longer the better, and a purring avid. However they must have Kate McCullough, visionary cinematographer, and Tony Cranstoun, extraordinary editor, wielding them. Blade runner, Oslo: 31 august, Bad Timing, The Way We Were, and 12 Angry Men. Filming at the jet propulsion lab was tough as the crew must be accompanied en masse everywhere in the facility - which obviously makes filming quite difficult - but hardest was getting to film in Cuba in 2012 for our last film ‘Here was Cuba’. It took many long months and skilful negotiating to get access to interview civilians and government about the Cuban missile crisis, but it was worth it. Carlo Rovelli’s ‘Seven Brief Lessons on Physics’ was stunning as was Neil Gaimen’s ‘The View from the Cheap Seats’ - I found it very inspirational. Favourite recent fiction was the beautiful debut novel from Dublin author Karl Geary “Montpelier Parade’, so profound and moving. Documentaries delving deeper in to real life stories, the world around us, and our past.